Stefan Bär: I have a Diploma Degree (Sociology 2007) and Doctorate (Dr.rer.pol. 2011) at Heidelberg University. Since 2007 I have worked as an Academic & Researcher at Max-Weber-Institute for Sociology and since 2013 I have been an Associate Member to the Cluster of Excellence which is called "Asia and Europe in a Global Context." In Summer 2016 I became a Deputy Professor in Organizational Sociology at Max-Weber-Institute for Sociology. The overall goal of the project was to identify and initiate necessary structural changes in the work of nurses at a German University Clinic. Based on consideration of the mental stress that nursing staff demonstrated in the results from a standardized survey, preventive measures in the context of a risk assessment of psycho-social stress was implemented according to the provisions of the German Occupational Health and Safety Act (§ 5 (3) No. 6 ArbSchG). A participatory approach was pursued, in which those affected by a possible structural change, the nursing staff, were also included in the problem definition and solution process. The technique chosen for organizational development was a focus-group discussion, a qualitative methodology, called the “Health Circle” (“Gesundheitszirkel”). Targeted for the preventive measure were approximately 2,500 registered nurses at the University Hospital. The constant involvement of the caregivers as experts of their working conditions not only allowed for a continuous feedback between actual workload and the necessary structural change, but at the same time increased the motivation of employees which was essential for the implementation of structural change measures. That is, the participatory approach moved the caregivers into a position where they could actively shape their own working conditions rather than just being exposed to them. Therefore, this approach empowered the workforce through their own participation. The conduct of the project was entrusted to the Max Weber Institute of Sociology (MWI) to help with each step of the process and to give advice based on the scientific findings. To carry out the risk assessment of psycho-social stress, a Steering Committee (including the scientific team) was established at the University Clinic. Apart from representatives of the project management, the Steering Committee members are high-ranking functionaries within the hospital including representatives of the hospital management, the staff council, the human resources department, and the occupational medical service staff. From the beginning of this project, the Steering Committee provided essential knowledge about the organizational structure and framework conditions to ensure the project’s success. Furthermore, the Steering Committee has met at regular intervals to provide on-going supports of the project. Moreover, the Steering Committee is authorized to help implement the measures, which have been elaborated within Health Circles. With the Committee’s presence in the background, it was possible for the project to develop and implement “bottom-up” organizational changes to improve the working conditions of the nursing staff. Organizational changes were therefore not only carried out together with the relevant stakeholders but also were supervised by the scientific team working closely together with the hospital staff using a focus-group technique, the Health Circle. The main objective of the project was to implement and observe the process and results of the application of the German Occupational Safety and Health Act (§ 5 (3) No. 6 ArbSchG) within the hospital context. The practitioners are the major participants in the process of implementing an organizational development technique, called Health Circle. Health Circle was adapted to the hospital context to enable the supervised University Clinic to comply with the applicable law in a systematic and sustainable manner. Following up with the provisions of the German Occupational Safety and Health Act, we surveyed mental stress of nursing staff (Bär/Starystach 2017). Based on the survey findings of nursing staff’s mental stress, preventive measures were implemented in an effort to reduce and prevent future psycho-social stress. Hence, the project stretches from a systematic risk assessment to the implementation of concrete organizational development measures. 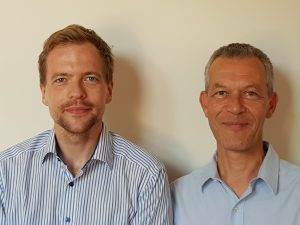 The operative goal of the still ongoing project is to identify and initiate necessary structural changes in the working conditions of the 2,500 registered nurses at a University Clinic in Germany. We pursue a participatory approach by including those influenced by a possible organizational change in the definition of the problem and the solution process. We chose the Health Circle (“Gesundheitszirkel”) (Senge/Klostermann 1997; Müller/Münch/Badura 1997; Lobnig/Nowak/Pelikan 1997) as a participatory technique for organizational development. Currently the implemented Health Circles are moderated, facilitated, and supervised by us, the project team of the Max Weber Institute for Sociology. Further, we developed corresponding training concepts to empower nurses to use the Health Circle technique without external experts in the future. 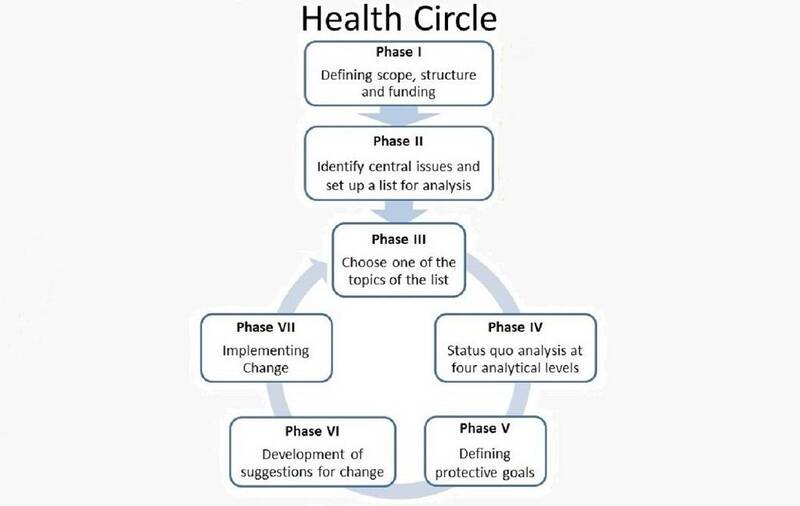 Therefore, the Health Circle is not only a technique to achieve suitable organizational change in a feasible participatory manner but also a technique for human resource development. The overarching goal is to institutionalize the Health Circle as a continuous reflection on the working conditions of registered nurses. The introduction and institutionalization of the Health Circle for other status groups within the University Clinic as well as the hospital context in general is intended. The legally required, but in practice underdeveloped risk assessment measures and corrective actions were inadequately addressed previously. This project will provide partial answers to the problem, with broad participation of the workforce. In 2015-16 we created an empirical inventory as a baseline of the working conditions, using a mixed-method approach utilizing questionnaires, interviews, group discussions, and documents analysis). First, approximately 2,500 registered nurses were asked to fill in a standardized questionnaire, which measures stress through various subscales. A sample of 735 nurses considered representative responded to the questionnaire. The statistics from quantitative data analysis were complemented by qualitative interviews with 40 professional nursing experts and two group discussions concerning the working conditions of nurses. Lastly, a document analysis served as a source for necessary context knowledge to interpret the results. As a second step, Health Circles were established at the end of 2016. This decentralized-participatory technique for organizational development was firstly put to the test in the 1980s in the automobile industry. Its main goal was to improve employees’ working conditions by corporately reducing health risks as well as supporting health promoting potentials at work (Knudsen/Buschk/Lind 2011). As indicated, the concept of Health Circle is not about individual behaviors, but rather it is structural and cultural working conditions that are the focus of analysis and potential change. We observe that Health Circle enables the hospital’s nursing staff to articulate their specific knowledge of the organization and work routines. The nursing staff acts as experts on their own working conditions on different levels. First, they define the social reality of their work in general. Second, together with the project team, they interpret the results of the empirical inventory. Third, they define the sources of stress within the working conditions. Finally, they define necessary change. Thus, those who are affected by stressful working conditions become involved in the course of modifying these conditions. The composition of the Health Circle can be either homogeneous or heterogeneous concerning status, function or working area of the participants depending on the specific topic. If the topic, for instance, is leadership, heterogeneous status groups should participate. The organization’s learning ability as well as its capacity for action will be increased by a) defining protective goals and the development of respective measures in the form of pilot tests and b) the implementation of the Health Circle as a permanent part of the organizational and human resource development. We observe that the participatory approach increases the motivation of the nursing staff and empowers them. However, the process is still in progress. Currently, there are three independent Health Circles at the University Clinic supported and moderated by the project team of the Max Weber Institute of Sociology. Based on data analyses of the empirical inventory, the Steering Committee identified the most urgent areas and corresponding topics for organizational changes. The topics of the Health Circles are: (1) appreciation and recognition at work, (2) work intensification in the intermediate- and intensive-care units, (3) stress in a department due to organizational changes after merging with the University Clinic. With the help of the moderators, the participants of the Health Circles currently present the respective results of each Health Circle in the steering committee. The results are discussed in terms of which measures have to be taken to meet the protective goals. The short-term goal is to implement the jointly decided measures. Medium-to-long-term goals are to evaluate the implemented measures (pilots) by means of empirical social research supported by the respective Health Circle and to disperse these measures into other areas of the University Clinic. Furthermore, there is a training conducted on moderation and management of Health Circles, so that future Health Circles can be moderated through the nursing staff itself. The concept used for carrying out a risk assessment of psycho-social stress, according to the provisions of the German Occupational Health and Safety Act, is suitable for the hospital context. The empirical inventory showed that there is a high to very high increase in terms of workload. However, there are distinct differences between the work intensification of the nurses regarding status, work time model as well as the medical and professional context. On average, nurses experienced an extensive imbalance between work effort and the received material rewards and immaterial recognition, which has detrimental effects on health (Siegrist 1996). Nurses working in intensive and intermediate care units as well as those working in rotating shifts with night shifts had the overall highest work strain. Nurses working in management positions experienced less stress despite a challenging field of work, which resulted in reproducing positive effects of perceived control over their own working process (Karasek 1979). Thus far, our research outcome based on extensive numerical and narrative data provides a general overview of the working conditions in scientific terms. The differences between the logics of organizational practice and scientific research have to be taken into account. Therefore, an empirical inventory can only partially reflect the actual working conditions in the way necessary for suitable, feasible and sustainable organizational changes. The participatory approach of the Health Circle complements our research findings by generating comprehensive expert-knowledge on challenging working conditions and how to improve them. The constant involvement of the caregivers as experts on their own working conditions not only allowed for a continuous feedback between actual working conditions and the necessary structural change, but at the same time increased the motivation of employees which was essential for the implementation of change. Thus, the participatory approach moves the caregivers into a position where they can actively shape their own working conditions rather than just being exposed to them. The presented concept not only strengthened the voice and the involvement of the staff, but also enabled a constructive discussion between employees and employer representatives. Possible conflicts can be prevented by the inclusion of all relevant status groups within the Steering Committee. The concept thus makes it possible to translate the given legal framework of the German Occupational Health and Safety Act into a concrete procedure that makes a joint contribution to the improvement of working conditions for both employees and employers. Our main medium-to-long-term goal is to implement the Health Circle as one of the leading techniques for organizational development in the supervised University Clinic. Through continued vocational training, we will pursue the approach that the Health Circle be participatory not only in the sense of participation in the definition of working conditions and how to improve them, but that it is governed and operated to the full extent by the nursing staff itself. In case of success, a self-organized reflection on working conditions would become a true part of nurses’ everyday work. External expertise, then, would only be needed to update the empirical inventory, which tracks change in an objective manner and to interpret the data to observe change patterns over years. That is, anticipated positive effects of participatory implementation of Health Circle by nursing staff demonstrating reflections on working conditions, along with numerical updates on effects of Health Circle presented by the empirical inventory, will produce the necessary knowledge which can be applied to further improve the working conditions of nurses in the clinical context. Karasek, Robert (1979). Job Demands, Job Decision Latitude, and Mental Strain, in: Administrative Science Quarterly, 24(2), S. 285–308. Knudsen, Herman; Busck, Ole; & Lind, Jens (2011). Work environment quality, in: Work, Employment and Society 25(3), S. 379–396. Lobnig, Hubert; Nowak, Peter; & Pelikan, Jürgen, M. (1997). Das Gesundheitsfördernde Krankenhaus als Lernende Organisation, in: Grundböck, Alice; Nowak, Peter; Pelikan, Jürgen M. (Hrsg. ): Gesundheitsförderung – eine Strategie für Krankenhäuser im Umbruch (195-210), Wien: Facultas Universitätsverlag. Müller, Brigitte; Münch, Eckhard; & Badura, Bernhard (1997). Gesundheitsförderliche Organisationsgestaltung im Krankenhaus. Entwicklung und Evaluation von Gesundheitszirkeln als Beteiligungs-und Interventionsmodell. Weinheim und München: Juventa Verlag. Senge, Peter & Klostermann, Maren (1997). Das Fieldbook zur Fünften Disziplin. Stuttgart: Klett-Cotta. Siegrist, Johannes (1996). Adverse health effects of high-effort/low-reward conditions, in: Journal of occupational health psychology, 1(1), S. 27–41.